Rubbermaid storage sheds are one of the most popular storage sheds in America. 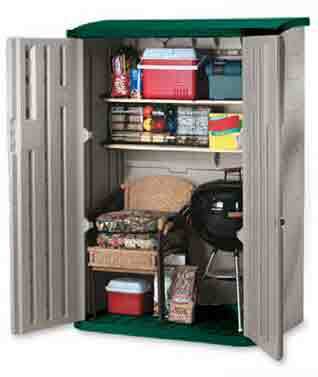 Since this storage shed is manufactured by Rubbermaid, you are assured of one of the very finest products. The name, Rubbermaid, provides you of a trusted brand among material handling suppliers. Rubbermaid sheds are made from Double-walled resin panels that lock together with just some simple tools. Each Rubbermaid shed comes with a heavy duty plastic resin foundation floor. Each unit is lockable and can accommodate wood shelves (not included). All Rubbermaid sheds can be found at Supply Hero. Supply Hero has become one of the largest Rubbermaid shed resellers in America. We invite you to call one of the Supply Hero customer service representatives, at 1-877-894-4884 to discuss your Rubbermaid shed needs. We will be happy to assist you with your purchase of a Rubbermaid storage shed.